*The lack of new housing starts has been “holding back the recovery, but arguably that drag is fading now that the financial system is recovering,” said James O’Sullivan, chief economist at MF Global Ltd. in New York. He expects a 12 percent increase in residential investment in 2011, along with job growth of 200,000 a month by June, as much as 225,000 a month by the second half and an unemployment rate of 8.8 percent by the fourth quarter. Given that many of these economists were forecasting continuing recession back in March 2009, when the stock market bottomed, how did this miracle turnaround occur? There are two answers to this question. First, the global economy has been successfully reflated with unprecedented and massive government support, and second, economists as a group make their projections by extrapolating from the present. In the United States, 20% of all disposable personal income comes from the federal government, in the form of Social Security to the elderly, food stamps to the needy, unemployment benefits to those out of work, Medicare and Medicaid, and various subsidies such as housing allowances for those in foreclosure. This percentage is at least double what was in place before the 2008 depression hit. The federal government has been financing this beneficence with equally unprecedented budget deficits, since there has been no serious attempt to raise taxes in the US since 1992. The all-in budget deficit for this year is around $2 trillion, up from $400 billion before 2008. Because of the strain this persistent, large amount of financing can cause the bond markets, the Federal Reserve has now begun to finance this debt directly, buying up to $600 billion of the debt this year in what it calls Quantitative Easing. For Quantitative Easing to work, interest rates need to remain stable or head lower, at least in the ten year maturity where the Fed has concentrated its bond buying. Instead, from the minute the program was initiated, interest rates have headed up. Traders understand that this program is experimental and unprecedented, except when it was used in Weimar Germany with disastrous results, or more recently in the hyperinflationary economy of Zimbabwe. There is a real fear in the markets that the inflationary consequences of all of this US debt will be hyper-serious, and people are running for cover. They are rushing to buy anything tangible that could hold its value in an inflationary environment: sugar, wheat, oil, corn, cotton, gold, silver, platinum, rare metals, and copper are some examples. They are buying anything tangible, except real estate, which is ironic because this is one of the two asset classes that the Federal Reserve has targeted in its Quantitative Easing reflationary program. The Fed wants housing values to go up in the US to reinvigorate the housing market, just as it wants “a little inflation” of the 2% or higher variety for prices in general. It not only wants to avoid what it considers the scary consequences of deflation, it wants to reinstitute the very environment of asset inflation that caused the 2007-2008 financial crash and depression. Ben Bernanke is doing exactly what Alan Greenspan did when he headed the Fed: avoid any economic pain resulting from bad investment and credit decisions by the banks, and use asset inflation to stimulate the economy. The market isn’t buying this program, at least when it comes to real estate. People’s memories as to the consequences of the most recent real estate bubble are apparently a lot more vivid than those of the Fed, or even of the US government, which wants to forget anything bad ever happened, let bygones be bygones, and let criminal behavior go unpunished. Not one major financial figure has been indicted in this financial catastrophe, much less been brought to trial. President Obama’s approach to the whole series of frauds perpetrated on the American public and global investors is to “look forward, not backward”, just as he did when it came to the practice of torture under the Bush regime. How About a Little Irrational Exuberance? “I think we are underestimating and continue to underestimate how important asset prices, very specifically equity values are, not only for shareholders and the like, but for the economy as a whole.” Alan Greenspan, CNBC interview, Friday, Dec. 3, 2010. “And higher stock prices will boost consumer wealth and help increase confidence, which can also spur spending. Increased spending will lead to higher incomes and profits that, in a virtuous circle, will further support economic expansion.” Ben Bernanke, Washington Post, Nov. 4, 2010. “Nevertheless, balance sheet policy can still lower longer-term borrowing costs for many households and businesses, and it adds to household wealth by keeping asset prices higher than they otherwise would be.” Brian P. Sack, New York Fed, Oct. 4, 2010. This was the exact same policy the Bank of Japan had in the 1990s when faced with deflation caused by a burst real estate bubble. The government stepped in periodically during the decade and bought equities, which helped the stock market and the economy temporarily for about six months or a year, but with progressively weaker benefits each time. Overall, the policy was a failure because the stock market fell from a peak of 36,000 down to 8,000 during the decade. In the US, the Fed announces the time and amount of its Treasury purchases from the banks, which promptly put this money into the stock market. It’s not clear if the banks are directed to do this, or are doing this of their own accord because there is no place else to earn a decent return. A lot of this money has also gone into commodities, emerging markets, and junk bond debt. In any event, everyone in the market is well aware of the Fed’s intention to boost consumer spending through the “wealth effect” of a rising stock market. It is precisely this effect that is being given credit for a revival of consumer spending this Christmas, especially in the luxury sector. Christmas sales in the US are estimated to be 4% higher than last year and at a record level, exceeding even the pre-depression levels set in 2007. Store traffic was heavy throughout the selling season, and retailers are expected to keep margins up because they learned to control inventory and offer only a limited number of discounts. Taking encouragement from the Christmas season, economists are extrapolating this consumer behavior into 2011 and coming up with aggressive targets on GDP growth, retail sales, and the stock market. Will they be right this time? The tendency of economists to extrapolate from existing conditions when forecasting is well known. Economists are in this sense no different from a typical investor, who often buys high and sells low. Nor are they different from stock brokers and market analysts, who typically foresee a rising market. The advantage to these positive biases is obvious: the economy, and the stock market as well, tend to go up more often than they decline. Recessions and bear market conditions are relatively rare and brief, so the odds favor anyone who is consistently bullish. Another consequence to this pattern is that economists do poorly at both predicting a recession, which is against their natural inclination, and timing a turn down in the economy. [A]ttempting to invest on the back of economic forecasts is an exercise in extreme folly, even in normal times. Economists are probably the one group who make astrologers look like professionals when it comes to telling the future… They have missed every recession in the last four decades! And it isn’t just growth that economists can’t forecast: it’s also inflation, bond yields, and pretty much everything else. Economists are doubly sanguine about their 2011 growth forecasts because the economy enters January with a special dose of fiscal stimulus: Social Security withholding taxes will be decreased by a nominal 2% during the year. This will add hundreds of billions of dollars to consumer pocketbooks, especially benefiting the poor and middle class workers who form the bulk of consumer spending. There is also a fillip to homeowners who are in the foreclosure process. Hundreds of thousands of these homeowners are no longer making mortgage payments but living in their home until the foreclosure is final. This can take well over a year in most cases, giving the homeowner spending money of at least $1,000 on average per month. In many cases where monthly mortgage payments exceed $10,000, the bank isn’t even bothering to press for foreclosure because it otherwise risks a write-off of a $3 million to $5 million mortgage. Given all this, can the economists possibly be wrong? Could a recession occur in 2011? Under the current state of the US economy and its heavy reliance on federal spending, we could answer this question quite simply if we knew when the US government credit card will reach its limit. At some point it must; the compelling reality of mathematical compounding alone makes it impossible for any country to continue to rack up new principal and interest obligations. Countries can also reach a danger zone in which the debt is so large that it can only be serviced if the nominal level of interest rates is close to zero and stays there. Japan is already in this situation and the US is rapidly approaching the point where a 2% or 3% increase in nominal interest rates (to about 6% for 30 year Treasuries) would eat up a huge portion of the annual tax intake of the federal government, forcing very painful cutbacks in military, social benefit, and other outlays. As to how long the US can carry on sustaining its spendthrift ways, the economists are telling us for at least a few years more. Many of them don’t even mention the budget deficit or rising interest rates as a serious risk to the economy. They are saying that life will go on as it always has, at least in their professional experience – the Fed is successfully reflating, even if its methods are unorthodox. Consumers are starting to spend again, banks are starting to lend again, companies are slowly beginning to hire, and all of this results in unstoppable momentum that produces a self-sustaining recovery. If this is really what is happening, why isn’t the Fed cutting back already on its Quantitative Easing, rather than waiting for the June 30, 2011 end date? Why doesn’t the Treasury cut back on at least a trillion dollars of its $2.0 trillion debt program for this year? And if these two things were to happen, how is the economy going to survive another shock of lost liquidity and stimulus? No one seems to have an answer to these questions, if they even ask them, because like everything else we are going through, this is uncharted territory. That alone ought to make you suspicious of any economist who argues that a self-sustaining recovery is underway. Since we’ve pointed out that economists are just like investors – going along for the ride during the good times and extrapolating the experience to infinity – how is that working out for the market? The record will show that as of the end of this year, the US stock market is heavily overbought, deliriously overconfident, and dangerously unprotected from a fall – just the sort of situation that existed in 2007 before the financial crisis hit. In fact – some of the sentiment figures are so absurdly bullish (not just in stocks but in junk bonds, precious metals, copper (the poor man’s precious metal), emerging markets – pretty much any asset class), that hardly anybody is out there who believes there is risk left in the market. This has led to another highly unusual situation where all major asset classes are nearly perfectly correlated, going up day by day together. There is, in other words, no protection to be had by being short one asset class against another. You could go short the stocks you own, and create a hedge for yourself, but no one is doing that either. The put-call ratio is back down to near record lows – investors are loaded up only on calls, expecting the market to continue to rise. They are doing so using leverage once again, just like in 2007, with hedge funds running 2:1 or 3:1 debt to equity. The use of margin in the US markets as of November was up to $274 billion, just shy of the record of $302 billion set in 2007 (right before you-know-what happened). For all we know, when the December data come out a new record amount of margin debt may be outstanding, most of it certainly used to buy stocks. Besides the laundry list of sentiment, stochastic, momentum, market breadth and other data all pointing to extreme overconfidence (some of the records going back to 1946 are being broken in this bull run), something else is happening that should be setting off alarm bells. Normally in a bull market the last people to be suckered in as buyers are the Mom and Pop investors who haven’t been paying attention until the bullishness starts spreading to television and newspaper headlines. The bullishness is certainly spreading, but Mom and Pop have continued to pull money out of the stock market, at least from the April high until this week. This has never happened before. Again, in normal times, Wall Street would be scared witless, because a market without a retail base is a market destined for calamity – it is nothing but a bunch of traders playing Hot Potato among themselves. Wall Street is ignoring all this because the Fed is giving away free money, and as everyone knows, you can’t fight the Fed. The Fed telegraphs the days it is going to be putting liquidity into the market, and on those days the stock market goes up. Because the Fed is in almost every day, the market is going up almost every day. The Fed is both preventing it from going down, and apparently prepared to step in and support the market if it ever got into trouble. Free money, as they say. If Mom and Pop are too stupid to see that, reasons Wall Street, too bad for them (though the reality probably is that Mom and Pop are pulling money out of mutual funds because they need the money to survive). If you are employed on Wall Street you can go to work every day with the confidence that this economy is all about you. The Treasury, the Fed, the Administration, the Congress, the media, the economists – they are all focused on how Wall Street is doing, and the wonderful spending power that comes from a market bubble. Taxpayer money is being shoveled out every day to Wall Street for its profit, which is all that seems to count in this economy. And it is not just taxpayer money at stake – it is future tax revenues being pledged in support of the Finance Economy, to the tune of hundreds of billions of dollars, amounts which even back in 2007 would have been eye-popping. So far, all we have to show for all of this is are record-setting bonuses for Wall Street, and a Christmas splurge on the 3-C’s – Cheap Chinese Crap. And oh yes – lurking deep in the background are red flashing lights telling us that the stock market is poised, perhaps as soon as January, for another plunge down, and maybe even a second Flash Crash, since absolutely nothing has been done by the regulators to prevent Wall Street computers from once again going all to Hal on their creators. If you believe the Fed is omnipotent and can prop up the stock market for eternity, to levels “higher than they otherwise should be”, than you should be fully loaded up on stocks by now. Everybody else is, so why not you? Maybe, on the other hand, you believe in gravity, or the market theory of mean reversion, wherein prices eventually always go back to an average growth rate. Maybe you are like the 90% of Americans who aren’t wealthy enough to afford a stock portfolio of your own (outside of your 401k), and maybe you understand that this economy is neither about you or designed to benefit you. If so, read on, because the day is coming when the economic order is going to be overturned. You still won’t benefit from this – in fact your standard of living may well go down – but the plundering of the Treasury for the sake of Wall Street is coming to a close. The Federal Reserve is out of ammunition - There is nothing left for the Fed to do if Quantitative Easing doesn’t work, and both QE1 and QE2 have been failures at keeping interest rates down. Ben Bernanke has hinted that QE3 may follow, perhaps involving the purchase of mortgage backed securities, but the new Congress will probably outlaw any such further attempt by the Fed to print massive amounts of new money. Five years ago the Fed was viewed with mystical reverence by everybody, but this depression has seriously damaged its franchise. It has been subject to calls by Congress to limit its mission, and some have even proposed that it be abolished and replaced with the gold standard (an idea that used to be considered crackpotty but is now taken seriously). An anonymous internet cartoon explaining QE2, and wickedly satirical of the Fed, has gotten nearly 4 million hits. Mystical reverence is essential to the functioning of a central bank, because its only product is confidence. The American public is losing confidence in the Fed, which means the day of trillion dollar bailouts of the banks and the markets are coming to an end. The US credit card is tattered and not about to be renewed - The global bond market is losing patience with American fiscal profligacy. The failures of Quantitative Easing to keep interest rates down on the long end of the maturity spectrum are critical signs not only that the Fed has no real control over these rates, but that bond traders simply cannot keep digesting all these Treasuries without more compensation in the form of higher interest rates. In fact, the existence of QE2 is an important “tell” in the global poker game – it is a desperate attempt by the Fed to replaced lost international buyers such as the Chinese and Japanese, who are no longer loading up on Treasuries the way they were. And if this isn’t enough, the Tea Party Poopers about to enter the Congress may deal the coup de grace to federal borrowing. There are fifty new Congressmen put there by voters fed up with government borrowing, and while every sign so far indicates that the Republican old guard leadership in Congress is happy to spend like nothing has changed, something definitely has changed. The leadership may have their feet held to the fiscal fire in ways we haven’t seen in nearly twenty years. One way or the other, fiscal pain is coming to the US, in the form of higher interest rates, less borrowing capacity, or even both. Economic misery is everywhere in the US and it is worsening - The media stories this Christmas have been about a rebound in consumer spending, combined with a deterioration in living standards for many Americans. We learned over the holidays that 50 million Americans no longer have health insurance, up from 43 million just two years ago. As an example of the utter uselessness of the American health system, the age group most lacking in health insurance are in their twenties, who are the healthiest Americans and who in any reasonable insurance scheme would be essential participants. Many young Americans simply aren’t earning enough to afford health insurance. Poverty is on the rise among all age groups; about 30 million Americans earn below the poverty level, and more than that number now receive food stamps. Two million Americans are homeless at least some time during the year (over 600,000 are chronically homeless). Immigrants, who are the major source of new payroll and Social Security taxes, are beginning to leave the country, hounded out by Republican demagogues. 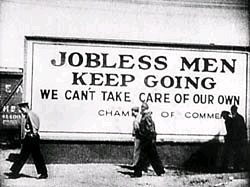 Republicans also have organized a concerted and well-funded effort to dismantle all New Deal programs, including Social Security, and President Obama and other Democrat leaders have for the first time given these campaigns credibility, which ultimately dooms the social support for the middle class and poor people. Without such support, the era of collective and community help for those in need will come to an end, and America will return to the laissez-faire, cruel world of 19th century poor houses. The indigent and the ill will be ostracized and hastened to an early death, as the federal tax system collapses. The reestablishment of the gold standard, with its use of on-going and vicious depressions to control social order, will be a fitting cap to the Republican attack on the New Deal. The states and cities have already seen their tax systems collapse - States and municipalities are way ahead of the federal government in terms of fiscal collapse, because they don’t have unlimited borrowing capacity. A number of states are preparing the way legislatively for municipalities to declare bankruptcy, and some hard-pressed states have already entered into their own form of undeclared bankruptcy, by deferring payments indefinitely (even on income tax refunds) or by issuing vouchers rather than cash. State and local services are being cut drastically, while taxes are increased and fee schemes proliferate. State and municipal unions – the last bastion of unionism in the US – are under attack as never before for their “selfish” pension demands, which will be eliminated over time because there simply isn’t enough money to meet these obligations. Meanwhile, no one will complain about the much more expensive pension programs laid out for ex-military officers (who aren’t blue collar union workers, after all), and of course nothing will be said about the preposterous pension programs for corporate executives or ex members of Congress. The US financial system is close to collapse - The deliberate public relations campaign by government, politicians, and business leaders to assure us that “all is well” when it comes to the banking system is unraveling. The dry rot that is destroying banks keeps eating away at the foundations of finance, the latest example being the revelations regarding the foreclosure process. The ugly, life-threatening reality that no one in banking wants to talk about is that the biggest asset class of the industry – home mortgages – may be severely compromised because the mortgages themselves may be uncollateralized. The simple fact that the banks have failed for twenty years to keep the borrower’s note connected to the mortgage document, and have both registered with local recorders of deeds, means that banks cannot really prove they are the legal lender with rights to foreclose. In at least 23 states that have a judicial foreclosure process, courts are beginning to tells banks “get in line with all the other creditors” rather than let them unilaterally evict a delinquent home mortgagee so they can sell the home immediately. Since most of these mortgages were securitized and sold off to investors, it also appears that the banks may be required to makes these investors whole. We just saw this week one such investor – Allstate Insurance – file a $700 million claim against Bank of America over this very issue, alleging fraud, and using SEC findings of fraud against the bank to bolster its claim. This is just the beginning. Dozens if not hundreds of such suits will cripple the big banks, which will have to be declared insolvent and thrown into receivership, since no more bank bailouts are going to be tolerated by the public. The FDIC will be called upon to make good on hundreds of billions of dollars of deposit insurance, but because it is already broke, it will have to turn to the Congress and an already-stressed government bond market for the money. Expect the bond market to extract much higher interest rates as a penalty for this new emergency borrowing. The housing market is already into a second, significant leg down - Home prices are slipping from their previous lows, and a market that is supported almost entirely by the federal government, through its receivership of Fannie Mae and Freddie Mac, is about to lose that prop. The Republicans are out to “reform” these two mainstays of the housing market, which means ultimately kill them off. Unfortunately, the banking industry will be in no position to replace them, having no capital to support home mortgage lending. A home mortgage will become a rare and precious thing. Even if the Republicans fail at their efforts to destroy Fannie and Freddie, the losses on their $6 trillion mortgage securities portfolio (a combination of what they own and what they have guaranteed to the banks) will make it impossible for the federal government to use these agencies in support of the housing market to the degree they have done in the past. Our elite masters have lost the capacity to lead - America suffers from a sclerotic and incompetent leadership in the political, financial, business, military, and media sectors. Years and years of “in-breeding”, wherein nepotism and oligarchy are not only tolerated but encouraged and lauded by the media, has created a class of rulers that focus on their narrow self-interest, or on their tribal interest politically and economically. These people are incapable of thinking of the interest of Americans as a community or a nation, despite their best intentions and misguided impression that they know and even live in the “real America.” As a result, the concepts of self-restraint, of ethical dealing, of responsibility for one’s actions, and of consequences for one’s mistakes, are alien to our rulers. The ruling class has turned parasitical, and we see examples of this all the time. People who are demonstrable failures in their job, like Timothy Geithner, are promoted and rewarded for failure. The leadership of the banking industry learned no lessons whatsoever from their massive losses in real estate, partly because the government bailed them out of their mistakes. Instead of cleaning house and reforming their operational practices, the banks put in place a misguided and poorly-supervised foreclosure process that has trampled on the legal rights of homeowners and resulted in people losing their homes because the bank made a mistake in its records. Not one financial executive has been indicted and put on trial or convicted of criminal behavior, despite rampant evidence of such behavior. The one exception has been Bernie Madoff, who defrauded wealthy people. The barriers of entry to positions of power are the highest they have ever been, since such positions are largely restricted to the scions of the wealthy, the well-connected, and those who can get into elite universities. It costs tens of millions of dollars to run a campaign for Congress, which is filled largely with millionaires as “representatives” of the people. To run for president costs at least half a billion dollars. Once in office, the revolving door between business and government means the elite are never lacking for a high-paying lobbying job or powerful government position. We just learned this week that in the past five years, 80% of all three star and four star Pentagon generals and admirals found retirement work in the defense industry. Many of these officers were simultaneously appointed to public commissions overseeing Pentagon spending, and not one of them saw a conflict of interest in this or recused themselves. All of them received simultaneously a lucrative federal pension for their service in the military. Our leadership has been corrupted by the opportunity for wealth, and has sold out to corporate paymasters. Moreover, the ruling classes are working to solidify their positions of power by reducing taxes on the wealthy and eliminating the estate tax, thus ensuring that a de facto aristocracy arises in the US, every bit as remote, disinterested, shallow, and intellectually feeble as the French nobility of the 18th century. If you wonder why problems don’t get solved in America, why the discussion of problems is limited or curtailed altogether, and why the media focus almost exclusively on bread and circuses, look no further than to our Congress, and count how many of them are the sons and daughters of previous Congressmen, and how many of these made fortunes serving as lobbyists once they left Congress. In America, there is no such thing as an incumbent “losing” an election, because the door to riches is always open to anyone who has held power. If you want a beautiful example of how this all works even for the venal and incompetent, and how wealth is bestowed on the children of the powerful, look to Sarah Palin and the Palin dynasty that has arisen. America is singularly unequipped to deal with emergencies and crises - Apropos of the comments above, there is no longer a capacity in the United States to plan long term, or to prepare for the unexpected. Incidences like Hurricane Katrina, the Gulf of Mexico oil spill, or the recent two feet of snow dumped on the Eastern seaboard, find local and federal government officials unprepared for the event and unconcerned for the consequences. As is now commonplace, incompetent government and business officials are never disciplined for these failures, and often praised and promoted. One entire political party is actively engaged in denial of global warming and denigrates science and reasoning at every opportunity. The Flash Crash catastrophe in the financial markets has been met with useless palliatives by the SEC, allowing hedge fund computers to continue to dominate market flow and allowing market risk to compound. The response to the next inevitable financial crisis will be met by the same third-world cronyism that attempted to deal with the first crisis, only this time politics may not allow for a bailout of the financial sector. Long term problems, like the disintegrating physical infrastructure of the US, the rising cost of energy, the over-dependence on the automobile and suburban sprawl, and the effects of climate change, go undiscussed if not ridiculed. One problem that may especially haunt the US in 2011 is the possibility of a commodity blow-off, already underway as a result of Bernanke’s QE2 policy. In this environment oil could easily approach $140/bbl once again, and make it obvious even to economists that the depression never really ended. Richard Parsons, the chairman of the bank's board, told CNBC "It's not a question of too big to fail. It's a question of being too interwoven in the fabric of the global financial life to fail." Allowing Citi to fail would be akin to having "the heart, the pump of the economic system fail because then everybody else dies," he said. "It's probably the most important private financial institution for maintaining our economic strength and presence around the world. You can't let an institution like that go down," Parsons added. The same thing can be said of Deutsche Bank, Barclays, BNP, JPM Chase, and on and on. Most of these banks are technically insolvent, and the world is just one bank failure away from a catastrophe that will drag them all down. That bank failure will happen, quite possibly in 2011. And finally, there’s China - What can you say about a country that has several newly-built, but completely empty cities that even the Chinese cannot afford to live in? This is just one of many uneconomic and likely fraudulent developments in China that scream out “real estate bubble!” The world is enraptured by China and the potential economic power of one billion plus consumers. The country has established itself as the manufacturing arm of the globe, and is sitting on a stated current account surplus of $2.5 trillion. China’s government stimulus program in response to the financial crisis of 2008-2009 dwarfs anything the US has put in place. Its tentacles reach to the remotest corners of Tibet, where farmers are given the money to buy televisions, washers, dryers, and laptops. The country has constructed the world’s biggest mountain of debt to finance overdevelopment and excess capacity in every industrial sector imaginable, and much of this debt is lodged with local governments and dark pools of money forged by housewives and other speculators, all away from the prying eyes and control of Beijing bureaucrats. The country is sucking in commodities from around the world, and is a co-contributor with the Fed to global inflation. While everyone sits mesmerized by all this wealth, power, and economic muscle, we ignore at our peril a fundamental fact: the world economy cannot abide even the smallest failure in the mighty Chinese industrial machine. Growth must continue at 10% per annum, the demand for raw materials must proceed unabated, over investment must not be stifled, etc. etc., because there is no other economic engine that can take the place of China. Yet the likelihood of a failure, or a chain reaction of failures, is quite high and could occur at any time. It’s 2011. All is well. Government statistics don’t lie, and a raft of economists cannot possibly be wrong. Don’t fight the Fed. The economic recovery will gather steam because the signs are all in place for continued growth. Everything will take place as it always has in the past. The capacity of the US to borrow its way to prosperity is bottomless. Enjoy, Enjoy, Enjoy! And if you have a niggling sensation that you have lived through this movie before, just ignore it. Ignoring things is what Americans do best. Climate Change was JOURNALISM'S Iraq War of lies. Climate change did to journalism what abusive priests did to religion. We will never trust mainscream media ever again. Thanks for reminding me. I'll just repeat OBEY CONSUME several times an hour. Someone just sent me an article about the world starting to look like it did in the Middle Ages, which claimed there were a lot of good things happening in Europe at that time (assuming we'd be like Europe this time around). What a crock. The Middle Ages was only decent for the Church and aristocrats. The vast majority were slaves with no opportunities. Hey, wait a minute, maybe that was the point. We need to happily OBEY and CONSUME. The media spin is ridiculous and yes they "frame messaging". If one notices the "news" is trying to make the path that the only way to reduce the deficit of course is to attack social safety nets. Unfortunately the task that really needs to happen, remove the profits from these for profit health industries, we completely lost. That's where the "budget deficit" needs to cut and that's private, for profit health industries. That's what will bankrupt the nation. But I'd claim this great media "consensus of economists", is a cherry picked group once again. Like running the Christmas retail sales numbers over and over instead of the record homeless, desperate and needing a job the real America is about. They just forget all about the homeless, the unemployed with no prospect of work, and the damn wars that are bankrupting us. It's all happy talk. Another example of "framed" media is the recent corporate media CNN poll that found "78% of Democrats" support Obama in the next election. They either cooked the question or the results. Nobody is excited about this guy in 2012. This is what's called plausible deniability - creating a fake reality to justify behavior that's clearly wrong and against the nation's interest. Happy New Year to you and EP! Yet with all the above stated undisputed and true, hope floats on a sea of despair. Everyone will continue to desperately pretend things are great and getting better, for to open our eyes and see our world as an illusion is beyond the capacities of our manipulated reasoning. Better to prepare for the worst, than to live as if every day will be a continuation of the past,for when the system crumbles it will snap suddenly and with much damage like a metal cable under tension that destroys all around it when it fails. Use these days as few or as many as they may be to prepare for a less energy and money intensive life style. Shelter, water, food - let these be your goals, learn to acquire and preserve and fill your hearts and minds with knowledge rather than fear and doubt. "... hope floats on a sea of despair. " Excellent advice as well. Nice piece. All you have to do is go to the national debt clock and look at the unfunded liabilities we have for Medicare, and Social Security to see that the economic end game is at hand. I'm 30, and I fully expect to be taxed to death in order to help come up with this money (in addition to the benefits cuts that will be bestowed upon the baby boomers). We're like Bethlehem Steel was with astronomical unfunded legacy costs that can never be paid. And the sad part is that the benefits are so needed by the many baby boomers that are ill prepared for retirement. I want to know why doesn't the media talk about the income disparities, the 1 in 7 Americans on food stamps, federal unfunded liabilities, etc? I think it's because the traditional media is purely entertainment based, and increasingly, I find myself coming to blogs to get unfettered information. The Fed is obviously desperate at this point. The sad thing is the writing has been on the wall for a long time about our economy. This report here: http://www.pwib.org/downloads/GrowFast.pdf outlined in the early 2000's the problems we would(and now are) facing as far as a lack of native born adults in their prime work years, and lack of skills. There's no national will to realize we're in it together, and hence no will to act to take care of the deficit, or unemployment. I believe the worst is still ahead. "People Who Work Should Not Be Poor"
That's from the link provided. It's a loaded sentence, in the best sense. It crystallizes obvious and profound practical and moral injunctions. Why will people work if they're not paid an adequate wage? How will they work well, do well, have a positive attitude toward their community, raise their families (since they'll need 2 or 3 jobs)? How can we expect people to work for bare subsistence when those benefiting from the work live comfortably? How can we sit by and see this go on, the exploitation of workers for work done and done well enough for owners to profit? Shameless greed and self interest is at the bottom of the troubles that we face. Those in charge know everything in that report. In fact, if there's a criticism of the report it's this: it fails to lay accusations at the feet of the system and those who run it that produces the inequities. On the issue of worker education, how many times have you heard a politician talk about how important education is and how it's their main agenda item if elected. That's when you turn around and run as fast as you can. They could care less. They defund programs and promote screwball ideas like private school vouchers and "magnet" schools, neither of which do a single thing for a broadly educated and efficient work force. The strangle hold by the to 1% who now take 70% of the net new income is the problem. That's why we hear nothing about income inequality. The people who take the lions share can't imagine an economy with anything more than we have now. As a result, they're stuck on stealing everything that isn't nailed down and letting the remainder struggle. They call it "letting the markets take care of it." And they have, and here we are. Excellent article. I've noticed that some people actually have a hostile reaction to hearing the type of insights you present here. It's apparently just too painful for them to face. Thanks for trying to get folks to wake up. It's probably too late to avoid most of the problems ahead of us, but waking up sooner is sure to be better than waking up later or not at all.